ABBOTT PARK, Ill., Jan. 12, 2017 /PRNewswire/ -- Abbott (NYSE: ABT) announced today the U.S. launch and the first commercial uses of the new EnSite Precision™ cardiac mapping system and Advisor™ FL Circular Mapping Catheter, Sensor Enabled™ to map cardiac arrhythmias during ablation treatments. The first commercial use of the system after U.S. Food and Drug Administration clearance occurred at the Intermountain Heart Institute at Intermountain Medical Center in Salt Lake City during ablation procedures conducted by electrophysiologist John Day, M.D. Since the landmark clinical cases by Dr. Day, additional procedures supported by the new EnSite Precision cardiac mapping system have occurred in 12 states nationwide, supporting ablation procedures to treat complex arrhythmias. Abbott expects its new cardiac mapping technology to quickly become a new standard for use in treating patients experiencing arrhythmias from multiple origins in the heart. In the coming weeks, physicians across the country will begin to use the EnSite Precision cardiac mapping system. "The new EnSite Precision cardiac mapping system allows better three-dimensional images of the arrhythmias in the heart, which improve the accuracy of what we see during the procedure so we can more precisely treat the patient," said Dr. Day, medical director of the Intermountain Heart Rhythm Specialists at the Intermountain Medical Center Heart Institute. "We were excited to perform the inaugural case in the United States, and we continue to utilize the system daily to provide the best patient care possible." When physicians use catheter ablation to treat abnormal heart rhythms, a small area of heart tissue under the tip of the ablation catheter is heated by radio-frequency energy, creating a lesion or tiny scar. As a result, this tissue is no longer capable of conducting or sustaining the arrhythmia. Cardiac mapping provides an inside view of the heart so physicians can visualize and navigate cardiac anatomy to deliver more precise ablation therapy. Built on a foundation of the St. Jude Medical™ cardiac mapping technology utilized in more than 2,000 electrophysiology labs around the world, the new EnSite Precision cardiac mapping system is the latest addition to the company's electrophysiology portfolio. This next-generation technology is designed to provide automation, flexibility and precision in cardiac mapping during the treatment of patients with abnormal heart rhythms (cardiac arrhythmias). Its dual-technology platform provides highly detailed anatomical models and maps to enable more efficient treatment of a wide range of irregular heart rhythms — including complex arrhythmias, such as atrial fibrillation or ventricular tachycardia. The EnSite Precision cardiac mapping system introduces new solutions, including the EnSite™ AutoMap Module, which enables the electrophysiologist to more quickly perform morphology matching that identifies the source of the irregular heartbeat. The EnSite AutoMap Module includes the new TurboMap feature, which allows the physician to build a map of the heart 10 times faster than current systems using recorded data. "This next generation technology was designed in collaboration with some of the world's leading electrophysiologists so that they can quickly and precisely identify the source and substrate source of a patient's irregular heartbeat," said Srijoy Mahapatra, M.D., medical director and vice president of Medical Affairs for Abbott's electrophysiology business. "We expect the EnSite Precision cardiac mapping system to become the new standard for identifying abnormal heart rhythms when tailoring treatment for patients suffering from arrhythmias." The EnSite Precision cardiac mapping system is flexible and enhances workflow efficiency by allowing physicians to map heart chambers with any electrophysiology catheter and customize procedures to address the circumstances of each case. The EnSite Precision cardiac mapping system and the company's sensor enabled tools also allow catheter navigation to occur with minimal fluoroscopy, thus reducing potential for risks associated with excessive radiation exposure. When physicians use catheter ablation to treat abnormal heart rhythms (arrhythmias), several long, flexible tubes with wires — called catheters — are inserted into the heart. Diagnostic catheters record electrical information from the heart and display it in a three-dimensional anatomical model, which is used to study the abnormal rhythm. Another catheter is used for the actual ablation. The doctor positions the ablation catheter so it lies on or very close to the targeted tissue. The small area of heart tissue under the tip of the ablation catheter is heated by radio frequency energy, creating a lesion or tiny scar. As a result, this tissue is no longer capable of conducting or sustaining the arrhythmia. The Abbott electrophysiology (EP) business is one of the fastest growing segments within the company's broader device portfolio. The Abbott EP product portfolio gives physicians the diagnostic, access, mapping and therapy solutions they need with designed integration for enhanced diagnosis and treatment of heart arrhythmias. A leader in collaborating with world-renowned electrophysiologists, clinicians and hospital administrators, Abbott develops safe and cost-effective treatment solutions for patients in need of advanced ablation therapies. 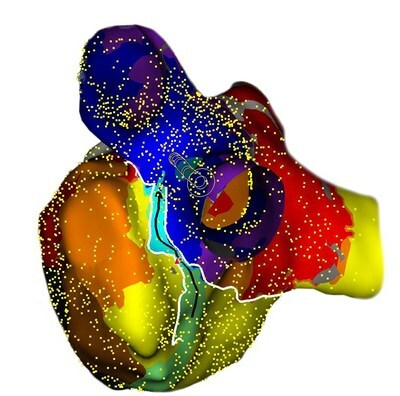 The EnSite Precision cardiac mapping system was developed to be used seamlessly with the existing portfolio of the Abbott EP products, including the TactiCath™ Quartz Ablation Catheter System, the FlexAbility™ Ablation Catheter, the Ampere™ RF Generator and the Agilis™ NxT Steerable Introducer. At Abbott, we're committed to helping people live their best possible life through the power of health. For more than 125 years, we've brought new products and technologies to the world -- in nutrition, diagnostics, medical devices and branded generic pharmaceuticals -- that create more possibilities for more people at all stages of life. Today, 74,000 of us are working to help people live not just longer, but better, in the more than 150 countries we serve.